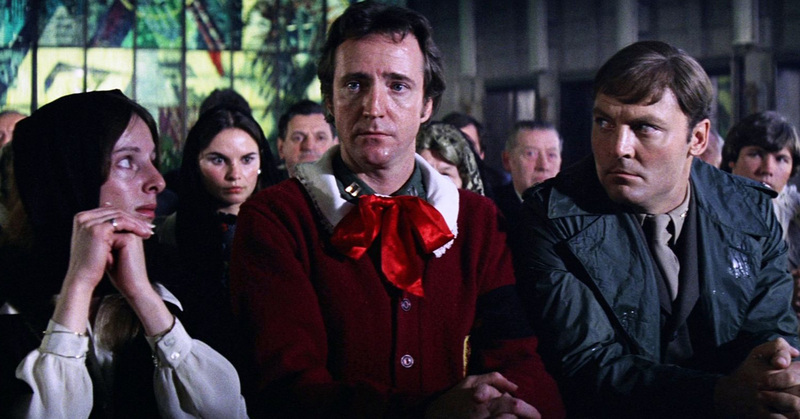 In one of the extras writer and director William Peter Blatty (author of The Exorcist) describes The Ninth Configuration as two acts comedy, with a final act of dramatic resolution. And to a certain degree that’s both a fair assessment and part of the problem. It is, for the most part, a pretty baffling affair with a the kind of religious conclusion which you would expect from a writer perpetually and thematically concerned with theology and the tangible existence of God and good and evil. The film, adapted by Blatty from his own novel, is set in a German castle which was long ago transported to America stone by stone. Now commandeered by the US military, it has been turned into a mental asylum for servicemen broken by the Vietnam war. It’s an asylum where the inmates are allowed to let their delusions free reign, where one inmate is flying around wearing a jetpack, one is blacked up singing Al Jolson songs and one is putting on a production of Shakespeare starring dogs because “Someone’s got to do it.” (Actually someone did do a Kickstarter for this a while ago). Admittedly the juxtaposition created by some of this behaviour is amusing, (some of it is just unfortunate) but doesn’t really seem to have any roots in real diagnosis of genuine psychosis. If Blatty is treating this kind of stuff as out and out comedy doesn’t that just cheapen the examination of mental illness? Especially if we’re being encouraged to laugh (which incidentally we don’t much – it’s not desperately funny). There are some trippy sequences where we appear to be seeing things from the point of view of astronaut Captain Billy Cutshaw (Scott Wilson), who suffered his breakdown in the capsule of a rocket that was about to take off. We see him having visions of being on the moon looking at Jesus on a cross. As he is an avowed atheist we clearly see that this is troubling thing. When Colonel Kane (Stacy Keach) arrives to take over running the asylum he allows the patients free reign to indulge their illness, even providing supplies to reinforce their delusions, rather than break them. He is a softly spoken, calmly mannered man – a psychiatrist who clearly has his own troubles. Bad troubles that keep him awake, of things that happened to him during the war. It’s no huge surprise to discover that Kane’s own troubles come to bear on the rest of the asylum occupants. What does come as a surprise is the way it happens, and the out-of-the-blue religious revelations. A long scene in a bikers bar is filled with the kind of daft movie thugs who stand in a circle around people having a fight, taking turns to join in rather than piling in. The lead biker is almost too camply pantomimic to be taken seriously, but the scene has real consequences. Structurally the movie is unbalanced, the most important section of the movie seems almost entirely divorced from what has preceded, almost like Blatty has been having too much fun with depicting the oddity of the asylum. The final act of the movie is interesting, and the ending is touching but is overshadowed by the undue prominence given to the “comedy” of the first two thirds of the movie. Some great performances – Stacy Keach and Scott Wilson are particularly worthy of note – are not enough to make a movie hang together. The story appears unfocused even if that’s not the intention. The Ninth Configuration is an interesting curio and is out on DVD and Blu-ray now.